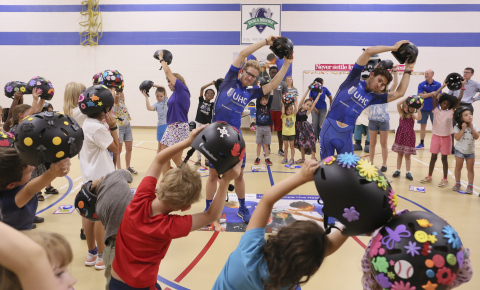 UnitedHealthcare pro cyclists Tanner Putt and Daniel Eaton lead healthy exercises and stretches with kids from the Denver Metro YMCA during a helmet giveaway event ahead of the Colorado Classic pro cycling race next week in downtown Denver (Photo: Barry Gutierrez). Denver Bike Unit police officer James Harvey helps fit new bike helmets donated by UnitedHealthcare to YMCA youth at a helmet safety event to promote bike safety, exercise and healthy living (Photo: Barry Gutierrez). UnitedHealthcare's Grant Snyder speaks during bike helmet donation event with UnitedHealthcare, the Denver Police Department and the YMCA of Metro Denver. UnitedHealthcare pro cyclists are featured with B-Roll of kids decorating helmets, being fitted for their new helmets and doing exercises and stretches. The event was done in advance of the Colorado Classic pro cycling race that begins next week in downtown Denver (Video: Everette McEwan). 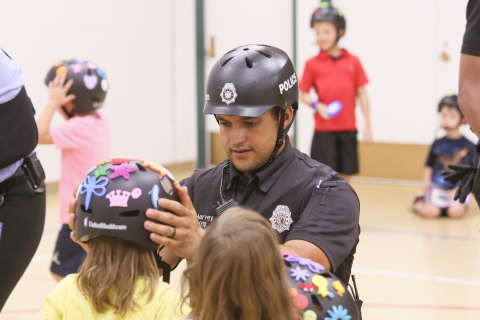 DENVER--(BUSINESS WIRE)--UnitedHealthcare pro cyclists teamed with the Denver Police Department today to donate 100 new bike helmets and provide bike safety demonstrations to kids from the YMCA of Metro Denver at the Dora Moore Elementary School. The event encouraged healthy, active lifestyles. UnitedHealthcare pro cyclists Daniel Eaton and Tanner Putt discussed the benefits of exercise and bike safety with the children, and encouraged them to attend and cheer on all the pro cyclists during the Colorado Classic in downtown Denver. The students chose their helmets and personalized them with colorful stickers and decals. Learn more about the UnitedHealthcare Pro Cycling team at www.uhcprocycling.com. 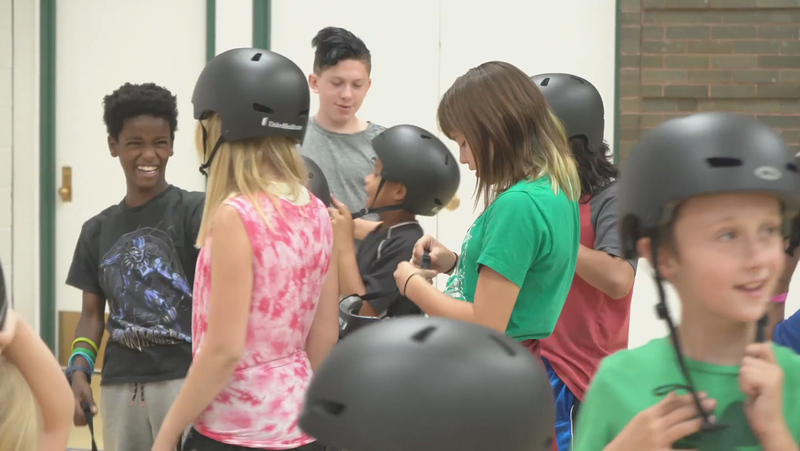 UnitedHealthcare pro cyclists teamed with the Denver Police Department to donate 100 new bike helmets to kids from the YMCA of Metro Denver.